Campus police were called to the library to investigate a report of inappropriate behavior on the second floor around 10 a.m. Monday, Jan. 12. According to a report filed by Officer Gordon Nelson, library employees had discovered the door of room 207 blocked and the lights out. Library staff told the two they were calling the police. Both left through the north library stairwell before police arrived. Nelson searched the library but according to his report, didn’t locate either person. The library’s Lead Circulation Assistant,Monica Carlisle said she was witness to some of what took place in room 207 which is designated as a group study room. “I did not see any studying,” she said. Carlisle said the room’s purpose is clearly identified with signage nearby and within the room and a list of rules is posted inside. Housekeeping was notified immediately after the incident, she said. Additional information is available in a supplemental report that was requested but not provided. 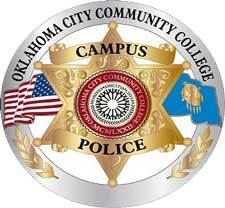 Some information was redacted from the reports under the direction of Marketing and Public Relations Director Cordell Jordan who said names are redacted “according to OCCCPD Standard Operating Procedures involving information released and information withheld.” To obtain a copy of the procedure, email cjordan@occc.edu.